The first sensor, the air-fuel ratio (a/f) sensor, sends pre-catalyst information to the ecm. The second sensor, the heated oxygen (ho2) sensor, sends post-catalyst information to the ecm. In order to detect any deterioration in the twc, the ecm calculates the oxygen storage capacity (osc) of the twc. This calculation is based on the voltage output of the ho2 sensor while performing active airfuel ratio control, rather than the conventional detecting method, which uses the locus ratio. The osc value is an indication of the oxygen storage capacity of the twc. When the vehicle is being driven with a warm engine, active air-fuel ratio control is performed for approximately 15 to 20 seconds. When it is performed, the ecm deliberately sets the air-fuel ratio to lean or rich levels. If the rich-lean cycle of the ho2 sensor is long, the osc becomes greater. There is a direct correlation between the oscs of the ho2 sensor and the twc. The ecm uses the osc value to determine the state of the twc. If any deterioration has occurred, it illuminates the mil and sets the dtc. 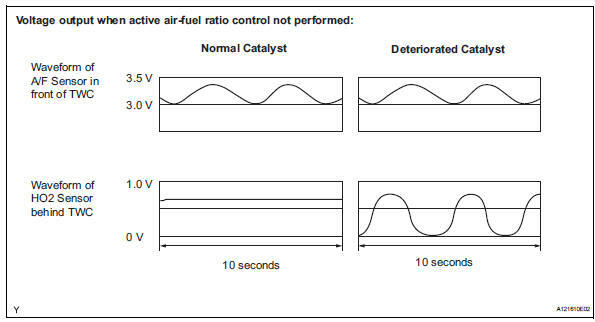 Performing this confirmation pattern will activate the catalyst monitor. This is very useful for verifying the completion of a repair. Select the following menu items: diagnosis / enhanced obd ii / data list / user data / cat cmpl. Check that cat cmpl is incmpl (incomplete). Note the state of the readiness tests items. Those items will change to compl (complete) as cat cmpl monitor operates. 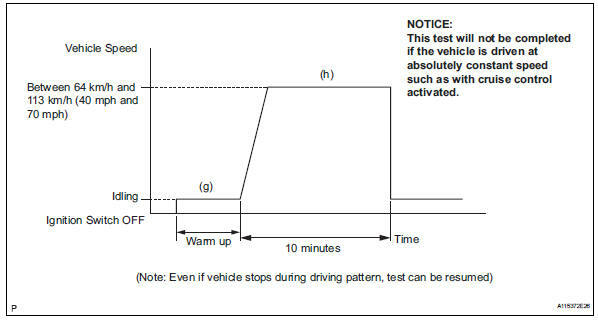 If cat cmpl does not change to compl, and any pending dtcs fail to set, extend the driving time. 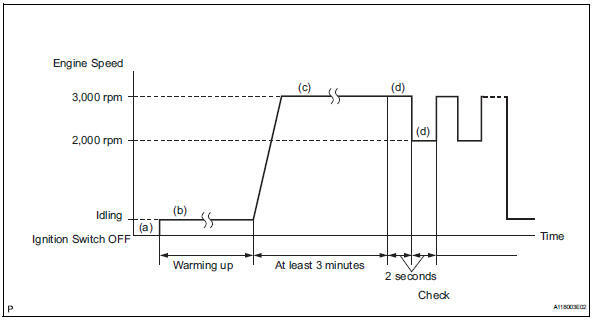 Perform the operation with the engine speeds and time durations described below prior to checking the waveforms of the a/f and ho2 sensors. This is in order to activate the sensors sufficiently to obtain the appropriate inspection results. Start the engine and warm it up with all the accessories switched off, until the engine coolant temperature stabilizes. Run the engine at an engine speed of between 2,500 rpm and 3,000 rpm for at least 3 minutes. While running the engine at 3,000 rpm and 2,000 rpm alternating at 2 second intervals, check the waveforms of the a/f and ho2 sensors using the tester. If either voltage output of the air-fuel ratio (a/f) or heated oxygen (ho2) sensor does not fluctuate, or there is a noise in the waveform of either sensor, the sensor may be malfunctioning.